It’s the 17th of February today, seven years past 17-2-1999, when we did have our last day in DAV Boys Senior Secondary School, Gopalapuram. Have several wonderful memories of this beautiful phase of life, from a school where I studied for twelve long years. Like several of my classmates, I owe a whole lot o DAV, for what I am. We had mostly great teachers right till the very end (when problems did begin to crop up) and always a great batch of students. From being very studious to extremely mischievous, we all had our great times in DAV. On 17th Feb, we had our farewell havan, as well as several farewell speeches, a victory lap around the school, capped by a treat at Pizza corner! There are possibly people whom I’ve not met ever since, and those whom I keep in touch with till this very day. The new bluwiki home at http://www.bluwiki.org/go/DAV_1999 is indeed helping. Schooling is always a treasured memory from childhood. I owe some of my best friends to DAV. 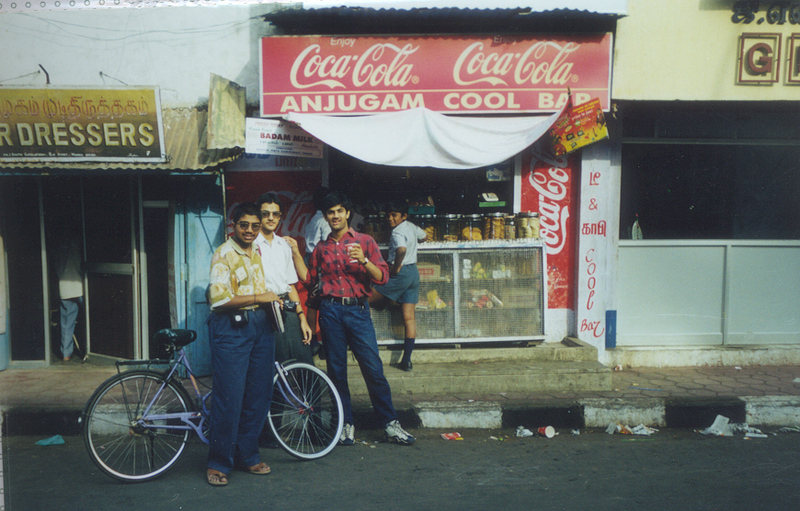 Can’t really think of much more to write… It’s always great to reminisce those wonderful days at DAV…. 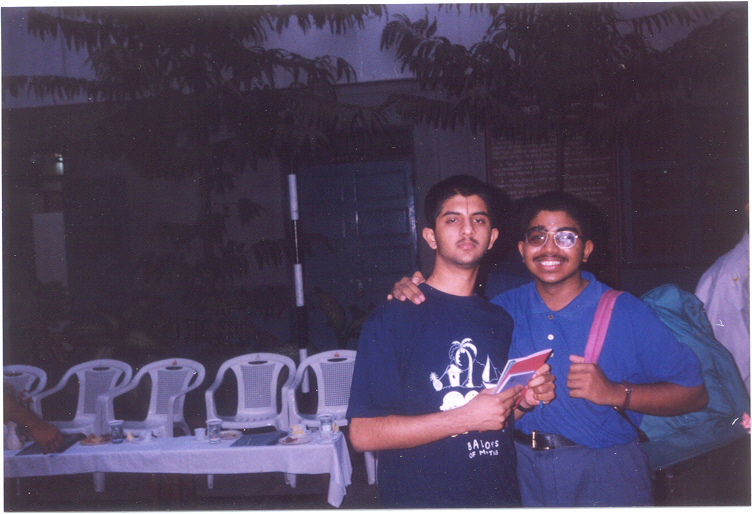 This is Rajan and me from 17-02-1999! Clarke’s tables and advanced to calculators and computers. When we had lunch in classrooms, corridors, playgrounds, under the trees and even in cycle sheds. When all the colors in the world, decorated the campus on the Second Saturdays. When a single P.T. period in the week’s Time Table was awaited more eagerly than the monsoons. And Neckties and socks rolled into balls. In the opposite house during Intervals and Lunch breaks. Gone are the days of Sports Day, and the annual School Day , And the one-month long preparations for them. Gone are the days Of the stressful Quarterly, Half Yearly and Annual Exams, And the most enjoyed holidays after them. It was February 12th of 1998, when our beloved Physics teacher, Prof Balasubramaniam, fondly known as Balsu passed away. Even for those miniscule 2-3 months that he taught us (we were in the batch where Ananthan handled the ~third part) — the Vanavani batch had been exposed to more of Balsu — he left quite an indelible impression of himself and his subject(s) on our mind. 173 students packed into that matchbox of a classroom at Sathiyamoorthi school was a truly (un)forgettable experience. His words “Am I right” resounding across the class, his wonderful handwriting, fantastic examples, “Walking is a series of forward falls”, inertial acceleration, normal reaction …. He was one of those wonderful perfectionists, very strict as well. He was very nice to the parents though. Any number of his quotes come to my mind: “What is thisangle?”, “What about the xxth problem” (when all power had failed in Sathiyamoorthi) and we were sitting in a neighbouring class. Balsu believed you could see and discuss a problem even without light. He did set high standards in everything. Though he always had the image of a hard taskmaster, he was quite considerate several times; I remember him being quite soft with me despite a 10/35 in the first test, grinning “You must improve Sir!”. I remember my cousin (a year senior to me; hence seen more of Balsu) quoting his sarcastic remarks on students getting zeroes, about how great scientists world over were struggling to reach absolute zero! He was quite an arrogant man, but commanded respect unlike many others. You could put that he was rightly proud. I remember vividly a class, when the student sat all over, right until the blackboard, affording precious little space for Balsu to walk around. He came in, ordered us to move once and when we failed to create sufficient space with our half-hearted efforts, he announced that he’d be cancelling the class. There was a huge commotion that followed and space was created out of nowhere for Balsu in the front, as he walked back into the class triumphantly, saying “That is Prof Balasubramaniam. See, you have moved atleast 12 (~) cm from where you were initially”. :D. More famously, “IIT is not the be all and end all of life. I am not from IIT”. I wonder if anyone has a nice snap of Balsu and could send it over; I have a very dilapidated one, cut out from a 1999 newspaper. It was indeed a major loss to the student community, when Balsu passed away. But he had already inspired many a young mind, both with his personality and physics!